April 30, 2015 marks the 40th anniversary of the end of the Vietnam War, precipitated by the capture by North Vietnamese forces of the city of Saigon, the capital of South Vietnam. In anticipation of the city’s capture by communist forces, the U.S. government began evacuating American Military and civilian personnel from Saigon in the month before the city’s fall. In a shocking miscalculation, formal plans by the U.S. government to assist in the evacuation of the tens of thousands of South Vietnamese citizens associated with the South Vietnamese government or those who aided American efforts in the war proved woefully inadequate. As combat engulfed the city in the final days of April 1975, the U.S. Embassy in Saigon was flooded with South Vietnamese refugees in fear of their lives, who begged the limited number of Americans who remained for help in escaping the advancing North Vietnamese army. What followed was one of the biggest helicopter evacuation operations in history. 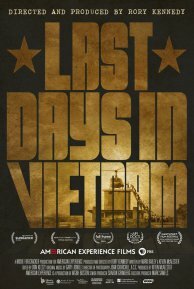 The dramatic story of the evacuation of the U.S. Embassy in Vietnam is movingly told in director Rory Kennedy’s Oscar-nominated 2014 documentary Last Days in Vietnam. Combining stunning archival footage with interviews of Americans involved in the evacuation efforts, those evacuated, and those left behind, the film manages to effectively reconstruct the chaotic circumstances and heroic efforts surrounding this pivotal moment in history. This is a documentary not to be missed.